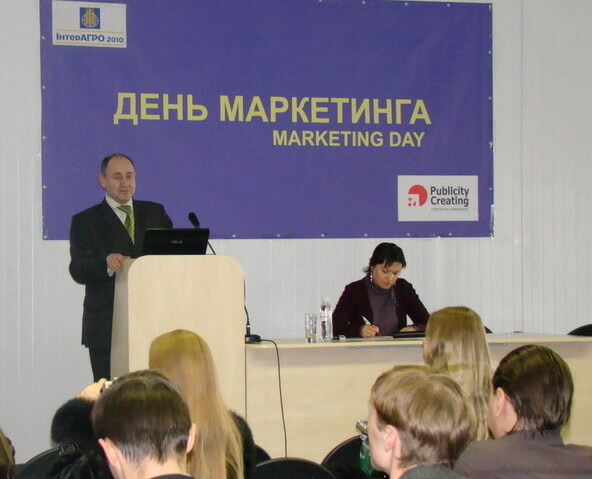 On the 4th of February 2010, was organized the Agro-marketing Day for the first time. It was held during the VI International Exhibition of Cost-effective Highly Efficient Agriculture - INTERAGRO. Founders of the event are the Publicity Creating Company and the organizational committee of exhibition “INTERAGRO”. During the Agro-marketing Day directors, marketing specialists, advertising and PR managers learned about efficient instruments, methods and technologies of marketing, brands promotion, reputation management and increasing level of sales on the agricultural market. The subject of Agro-marketing Day was the Efficient Marketing Instruments for Agriculture. The event was conducted in the form of session with lectures. Valeriy Kureiko, the Director General of Publicity Creating Company told about features of PR-activity on agro-market, which allow to increase the fame of company, fill up media with positive information, to form or to change public opinion about company, strengthen its reputation, to form partnership. This will influence on a marketing result - increase in sales of a company. The most effective methods for achieving such marketing results Valeriy Kureiko marked press-releases/articles writing and distribution, corporate and press events, cooperation with dealers and partners. But all mentioned above technologies are efficient under partnership with a professional PR-partner. The CEO of IAC “Publicity”, Rouslana Plis told about results of research about Situation on PR-market, conducted in December 2009 – January 2010. Questioning included 210 companies of key business spheres, including an agro-market. Particularly, 60% respondents, presenting this market consider that PR - is an effective method for reputation management and increase in sales during crisis. It means that companies in agriculture clearly understand influence of PR-activities of marketing results. The questionnaire also was found out, that companies of agro-sector used comparatively poor range of technologies for promotion, and, yet, do not use enough possibilities of outsourcing. Accordingly, Rouslana Plis gave recommendations on decline of informative and reputation risks in during crisis. Lectures of all speakers were with case-studies. The organizing committee plans to make the Marketing Day on the “INTERAGRO” exhibition an annual event.